Join us for this men’s breakfast at the Chapel every second Tuesday of the month (September-May). The Maryville College Concert Choir from Maryville, Tennessee will lead us in worship on Sunday, March 10, 2019. The Maryville College Concert Choir was organized in 1917 for the purpose of singing vesper services and was appropriately named the Vesper Choir. It became a part of the music curriculum in 1936 and underwent a name change to the “Maryville College Concert Choir” in 1954. Of the numerous fine directors, the one with the longest tenure is Dr. Harry H. Harter, who led the group from 1947 until his retirement in 1981. Current director is Stacey Murphy Wilner, who is the director of choral activities at Maryville College. Wilner has served as past president and as the repertoire and standards chair of the Tennessee chapter of ACDA. Today, members of the Concert Choir serve as musical ambassadors for the college, touring both domestically and internationally. Participation is by audition only and many of the students are music or choral scholarship recipients. Students assist in hosting All East Chorus in November, participate in an annual fall retreat and host a benefit Invitational Choir Festival, to support non-profit groups such as the Blount County Boys and Girls Club, the Joy of Music School and Africa-Eli. Performances throughout the year also include Homecoming Choir Concert, A Maryville Christmas, Spring Homecoming Concerts, Knoxville Opera’s “Rossini Festival”, and performances at area churches and other events in the community throughout the year. As part of 2016 “Journey to the Heartland” tour to Scotland, the Concert Choir performed at St. Andrew’s University with the St. Salvator’s Chapel Choir. In January of 2018 and in February of 2019, the Concert Choir hosted artist-in-residence Paul Phoenix, a grammy award winning former member of the The King’s Singers. The choir participates in master classes each year with professional musicians such as Cantus, Jacqui Horner-Kwiatek formerly of Anonymous 4, Dr. Joe Miller of Westminster Choir Collegeand most recently with Voces8. The Concert Choir performed at the Tennessee Music Educators Association State Conference in Nashville in April of 2013 and 2017. The “Make Our Garden Grow”spring choir tour in March will include locations such as Spartanburg SC, Fernandina Beach FL, Sarasota FL, Clearwater FL and Valdosta GA. Affiliated with the Presbyterian Church, Maryville College is a nationally ranked institution of higher learning that successfully joins the liberal arts and professional preparation in partnership with others. The philosophy of the students in the Concert Choir closely follows that of Maryville College founder Isaac Anderson, which is “to do good on the largest possible scale”. Homes are needed to host the singers in groups of 2 or 3 (or more). Hosts will need to pick up the singers at 8pm at the Chapel on Saturday, March 9. You’ll want to have some evening snacks and offer breakfast. Willing to host? Sign up below! Anne Lamott hooks into our common experience and guides us to an understanding infused with openness. An activist, former alcoholic and Sunday School teacher, Lamott uses humor to weave through loss, parenthood, faith and the cancer diagnosis given to her best friend, in beloved books like Bird by Bird and Help, Thanks, Wow: The Three Essential Prayers. She says, "Hope begins in the dark ... if you just show up and try to do the right thing, the dawn will come. You wait and watch and work: you don't give up." A Clearwater Beach tradition is ready to launch. Chapel-by-the-Sea and Religious Community Services (RCS) will kick off the 10th Annual Beach Walk/Walk on Sat. February 2, 2019. Chapel-by-the-Sea and RCS partner to raise funds to provide food and services for the less fortunate residents in Pinellas County. Last year the RCS Food Bank and The Haven for Domestic Violence served over 165,000 needy people. Since its inception in 2010 the Beach Walk/Walk has raised over $100,000 in support of RCS’s activities. The Palm Pavilion launches the event with registration at 7:30 am and the starting lineup at 8:30 am. A sumptuous pancake breakfast provided by Clear Sky Café follows the race back at the Chapel. Many local merchants and residents contribute to the event as sponsors as well as donating to the Walk’s Super Silent Auction. The cost is $30 for pre-registered walkers ($35 after Thursday January 31), $10 for those ages 6-18. The family maximum is $75. You may pre-register online (form coming soon) at Chapel by the Sea or pick up a form from the church. Stick around after church for a delicious dinner prepared by our Peace Cafe crew as a fundraiser to support our church’s efforts with Peace Cafe—a ministry that feeds those experiencing homelessness that we participate in monthly. More details to come. . .
Join your friends from the Chapel and volunteer to work on the annual “Faith Build” by Habitat for Humanity of Pinellas County. Look for a sign up sheet beginning in January. For our first season of Chapel Chicks, we’ll screen a different TED talk each month. Here’s what’s up in January . . .
More Information & Registration: Click here. 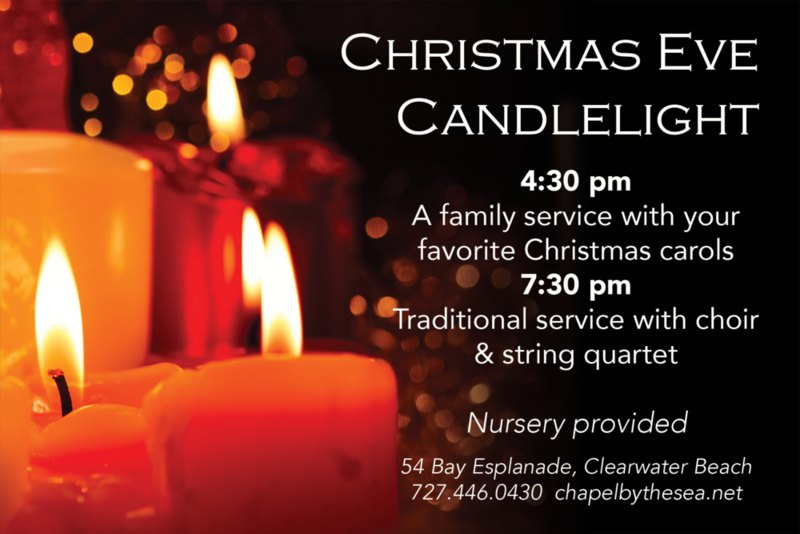 Our traditional Christmas Eve Candlelight service featuring our Chancel Choir with string quartet and a special Christmas eve message from our pastor. Nursery available. New in 2018—a Christmas Eve service with families in mind! Sing your favorite Christmas carols, hear a special Christmas message from our pastor, and enjoy the candle lighting ceremony. Nursery available. The holidays can be difficult for those dealing with grief and loss. This service offers a chance to remember, give thanks, and light a candle as we come together seeking the Prince of Peace. Join our Chancel Choir as they perform some of their favorite Christmas selections. Then stick around for a wine and cheese reception afterward. Movie Night: "The Star of Bethlehem"
There is work for every age and skill level, making our space festive for the holiday season. We put up several Christmas trees, and deck the halls. Linda & Keenis Owens chair this effort, and give us lunch after the work is done. Lots of fun! Join us to pack meals for those facing food insecurity all over the world. There’s a job for everyone, ages 3-103! Beginning November 4, rather than just the Sunday before Thanksgiving, bring non-perishable food and leave it in the wagon in the narthex. The children will bring it forward during the service and place it on the chancel. We will thus build a bountiful offering to help RCS Food Bank feed the hungry in our area. Wait for November 18 to bring the turkeys! Bring a dish or pay $5 and join us for a potluck dinner! Pastor Rhonda will lead us in a program called “Becoming” designed to unleash our potential in order to live more fully into who God is calling us to be. Food! Fun! Fellowship!